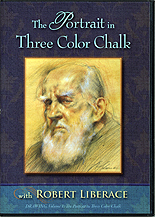 The classic technique of three chalk or "trois crayon" is one of the most elegant and efficient methods of rendering the portrait. It involves the manipulation of red, black and white to suggest the warmth and richness of flesh hues. It is not only a visually compelling technique, but also a means to connect with some of the great artists who used this approach, such as Rubens, Watteau, and Holbein. Robert Liberace, one of America's foremost artists and teachers, known for his inspiring and informative teaching style, takes you through the entire process of creating an original drawing while explaining everything from the selection of materials to his techniques to final touches. Special features include paper preparation, art gallery, and video previews from the five demos in this series.